No grades, no testing, and student-led learning are just a few reasons to start an after-school STEM program! After-school clubs are a safe space for students to explore, fail, and persevere, while gaining confidence in STEM subjects. Teachers have the freedom to be creative and student interest will drive learning. Sounds like an ideal learning environment to me! I (Natasha) have been running an after-school Space Club program for 4 years now. I left a career with the Department of Defense and traded nerdy engineers for unruly middle school kids. When I started, I thought I could walk into a school with my brilliant ideas for inspiring kids, principals would roll out the red carpet, and the magic would begin. Yeah, that didn't happen. I had to beg schools to let me start Space Club. Principals saw my ideas not as a value to their students but as a burden on their time. Sports took over all after-school hours, and students would rather hang out at a nearby park than stay for more academics. But despite these challenges, I carried on. I didn’t really have a choice. I had quit my steady engineering job for this crazy idea. And I was determined to get through to the students. So I convinced science teachers to let me have a few minutes in their classroom. I brought some model rockets, did a fun balloon rocket demo, and showed some cool photos of a satellite I worked on. And you know what? Fifty kids showed up that first day of Space Club. And since 2014, through rocketry, epic weather balloon launches, and space colony competitions, we have reached over 930 students in Space Club across five middle schools! 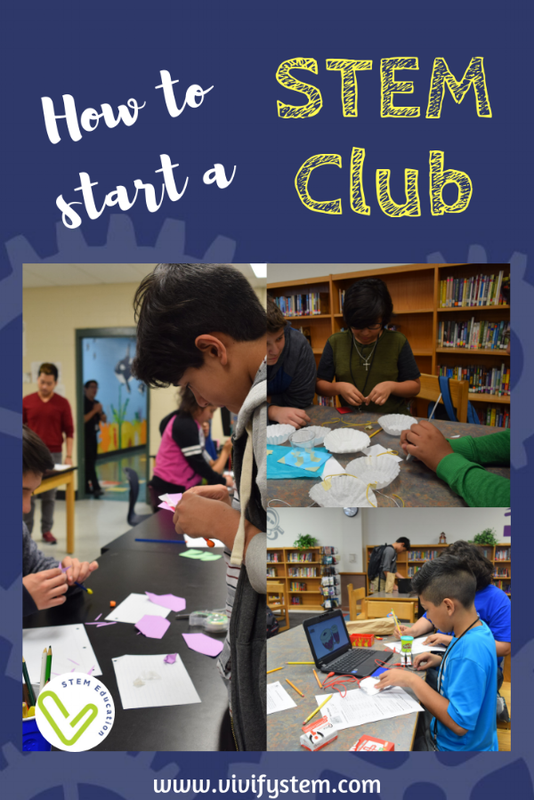 Are you ready to start your own STEM Club? Based on my experience, here are the 5 steps to start your own program! Who is your audience? Are you targeting all students or specific groups? My program targets students who show an interest in STEM pathways. What is your end-goal? Do you want to inspire students, build confidence, or develop certain skills? Space Club builds basics STEM skills for a foundation to prepare students for more advanced STEM pathways. We emphasize the engineering design process with standards-aligned activities that build up to long term projects. Do other STEM programs exist either in the classroom or after school? Research what other programs are available so you are adding to the opportunities instead of replicating programming. STEM clubs can cover robotics, cybersecurity, environmental engineering, and so much more. The best club combines the interest of the teacher with something that attracts the students. STEM is very broad, but a lot of resources are available to jump start your program. Research STEM competitions. One option is to center your club around an annual competition, which would provide a focal point for weekly meetings. 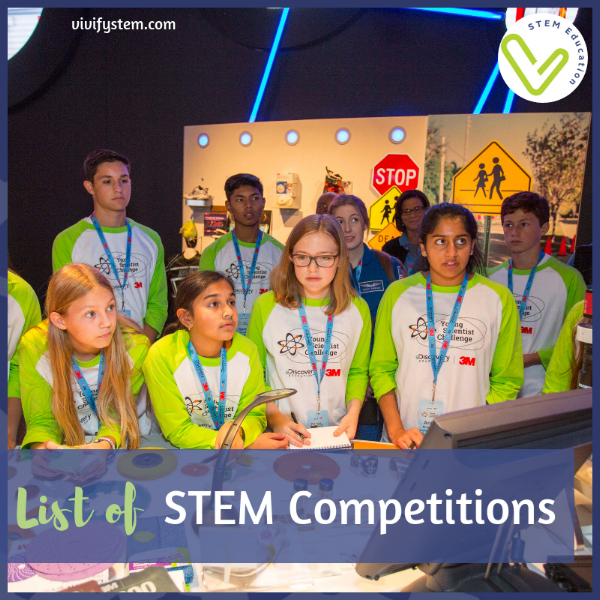 Check out this Ultimate Guide to STEM Competitions, or this list from ISTE which shows options from app design, robotics, satellites, rocketry, and so much more! Competitions are a great way to get students excited and stay motivated throughout the year. Consider cost. Robotics is always a popular option such as First Lego League or BEST, but these competitions require expensive kits and competition fees. More affordable options are available such as Young Scientist Challenge or eCybermission that are virtual competitions or Future City that uses recycled materials. STEM competitions provide a rubric and project constraints, but they don’t often offer detailed lesson plans. Depending on the skill level and motivation of your kids, you may need to put in some planning time to help guide teams. But there are exceptions. Future City has a database of lesson plans, and I know several teachers that use these lessons as part of their gifted and talented curriculum. Another option is to plan weekly STEM design challenges, perhaps centered around a theme. PBS Design Squad, GirlStart, Teach Engineering, or our Vivify STEM products are a great place to start. Engineering is Elementary is another option for a curriculum that connects to a theme of empathy. You can find a full list of lesson plan databases here. You may also consider a long-term project-based activity such a community garden or a weather balloon launch. We have several weather balloon posts detailing our experience with this epic journey to the stratosphere as well as a complete project guide. Through my experience with Space Club, I have developed an after school STEM curriculum called Launchpad that targets students new to STEM. The lessons transform students into a team of astronauts challenged to complete 10 missions centered around a Journey to Mars. The curriculum builds student confidence and interest in STEM with increasingly more advanced activities and tons of connections to real-world current events and STEM careers. You can learn more here. Once students complete Launchpad, they are better prepared for more rigorous STEM opportunities like robotics competitions. If your students are volunteering to join the club versus this being integrated into an existing classroom or program, the name can really effect your participation. I am just going to stay it… naming your program “STEM Club" is lame! Do you think the average kid will think oh hey, I bet STEM Club is cool! Do students even know what STEM really means? I recommend picking a name that will connect with a broad audience. Consider that some names will have negative stereotypes attached. At my school, Robotics Club is very male dominated as our girls don’t see themselves as building robots or coding. They really have to be tricked into it sometimes! Even if you are choosing a robotics competition, consider a generic name for the club such as Explorers or Inventors Club. This is why I selected “Space Club.” I found the topic to be exciting and intriguing to many students, and you can read more about my thoughts on how space can inspire youth here. We still do coding and robotics in Space Club, but we have over 50% girls participate! Last school year, I trained educators in our Launchpad STEM curriculum to implement as a STEM club. Most schools decided to use “Launchpad STEM Group” as the name of their program. However, when marketing to students, they just stated the group as Launchpad. I found that keeping the STEM acronym might be important if selling to admin or parents. How will you fund your supplies? STEM can be expensive! In our next blog post, I will review several funding options in case your school is limited in resources. Where will you meet? Try to find a space that will allow you to show videos and has large group tables for building challenges. Storage is another must as any STEM Club will need plenty of supplies (unless you are going virtual such as a coding club). Depending on how many students join, you may need to consider the library or cafeteria for a larger space. When is the best time to meet? Once a week for 1 - 2 hours is typical for an after school program. Consider conflicting events such as band practice, sports, and other clubs that may limit participation. How will student enroll? Does your school require special permission forms for clubs? Will your program run year-round or for a shorter time frame? Will you offer ongoing enrollment or a one-time deadline at the beginning of the year? My Space Club program is a year-long, intensive STEM program that first builds a foundation of STEM skills and culminates into a rigorous STEM space colony competition in the spring. We have a large group of 40 - 60 students that meet weekly in the library, and it takes an army of teachers and volunteers to make it happen! For Launchpad STEM groups, staff run the program in 10 week rotations with a small group of 6 - 12 students. Smaller groups leads to more personalized programming as students explore STEM fields through hands-on design challenges. Hopefully these steps provided some motivation to start your own STEM club! One of my students struggles academically due to behavior issues. He is often removed from class for acting out. When I put him in the STEM group, he was suddenly taking the lead on challenges and getting creative. It really had an impact on his self-confidence. Best of luck starting your own STEM club! Older PostBolt: Is Sphero's Latest Robot Worth the Hype?